Nearly three years ago my daughter Djuna moved to Brighton, where she found an apartment on Selborne Road, pretty much on the border of Brighton and Hove. Like she had done in her previous apartment in London, she reserved a place on her wall for the cover of This Is Welfare. Darja and I suddenly realised that the cover photo was taken here. After all, the photo was named after the city: Brighton 2. It was taken by Paul den Hollander around 1980. In 1982 it was featured in a book titled Moments In Time, published by Bert Bakker. I was working there at the time, and I noticed the photo when the book came in from the printing office. 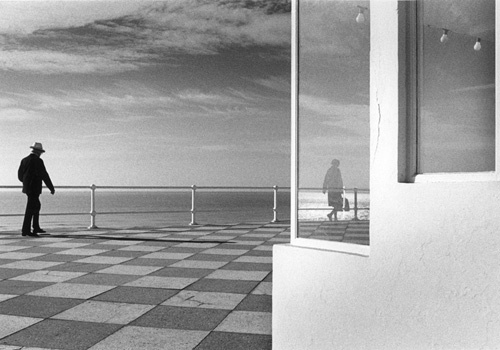 I was immediately struck by the grey tones, the woman reflected in the window of the beach pavilion, the “empty” landscape. 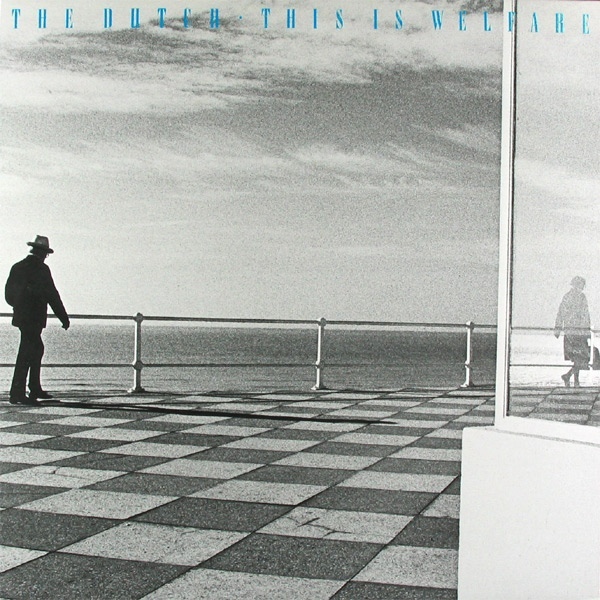 When we were discussing alternatives for the cover of This Is Welfare a year later, it occurred to me that Brighton 2 would be the ideal visual. I approached Paul den Hollander via the publishers house. It took a while before he was enthusiastic. The rectangular picture would have to be cut into a square LP cover. But fortunately he changed his tack. It must have been the prospect that his work would hit numerous record shops around the world. At least that was what I held out. He accepted that the size of the image would have to be adapted to the music industry standard. For instance, one of the consequences would be that the wire with bulbs on the right of the picture would be missing on the cover of This Is Welfare. But nevertheless the photo remained its visual strength and it was a beautiful, mysterious cover. So many years later, when Djuna pinned the LP cover to her wall, obviously we had to find out where exactly the photo was taken. Now between the Brighton Marina, from Hove to Shoreham-by-Sea, a long stretch of pedestrian promenade separates the shingle beach from the boulevard. There are weathered pavilions as in the picture, and we recognised the railing, but the pavement is nowhere black and white checkered like it is on the sidewalk in Brighton 2. We walked those miles several times -which is by no means an ordeal- but we could not find the spot where the hatted man and the lady with her bag had walked in 1980. I decided to e-mail Paul den Hollander and order a poster size copy of the photo, and in the mean time solve what had become a little mystery to us. After several failed attempts to make contact, he sent me a message in which he made a confession. What was the case?In 1980, he had been on a cycling holiday in the South of England with his girlfriend. This particular photo was shot in Hastings, and there they had an unpleasant experience (unfortunately I was too polite to ask further). Back in the Netherlands he decided that Hastings had dashed: he named the picture Brighton 2. 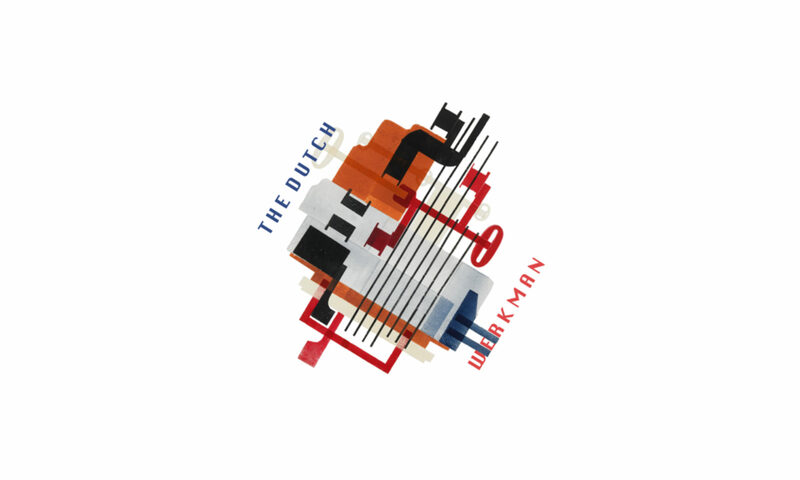 It starred in Moments In Time, was adopted by Art Unlimited as a commercial postcard and hit the record shops under the name The Dutch – This Is Welfare. Nobody discovered the change of location until Djuna by chance went to live in Brighton and that was when Paul’s benign juggle came to light. When Jan heard the story, he laughed. He and his wife Paula had already spent hours and hours looking for the place of the photo each time they visited family in Brighton. And all the time they only had to walk 36 miles to the east!